ST. LOUIS (RNS) — Farida Ahsan, a candidate for school board in this city’s Parkway district, was answering a question about racial disparities in school discipline when a melodic phrase came over the loudspeaker. It was the Muslim call to prayer ringing through the Islamic Foundation of Greater St. Louis, where the forum was being held. Saad Amir, the director of Muslims for a Better America, a sponsor of the forum, informed the audience that there would be a 10-minute break. If non-Muslims wanted to observe the prayers, they could take their shoes off and do so. The interruption was nothing unusual for the Muslims who had gathered to hear from the candidates or for Muslims for a Better America, which has been pushing to get members of the Islamic faith more involved in civic life. There are about 70,000 Muslims living in the St. Louis area, according to an MBA study; many came from the Middle East in the 1970s, after the abolishment of a federal quota system concerning immigrants, and from Bosnia in the early ’90s because of a war in that country. MBA reports that only 12,850 local Muslims, about 18 percent, are registered to vote. Amir, who was born in New York, said Bosnian Muslims have sometimes been reluctant to register and place their names on government lists because of their experience with genocide and ethnic cleansing during the war at home. Other Muslims think political engagement — “making noise” — will only bring negative attention; still others think that voting and participating in a democracy violates Shariah, or Islamic law. Then there is the general apathy or disinterest in politics that leads to low voter turnout among Muslims and all Americans. Amir looks to organizations such as the Archdiocese of St. Louis, the American Israel Public Affairs Committee and the Anti-Defamation League as models for work at the intersection of religious and nonreligious affairs. At the MBA forum, Ames said she was “not xenophobic, homophobic, anti-Islam, anti-Semitic or racist,” according to news reports. She took just 12 percent of the vote and lost. With two open seats in this year’s election, which will be held April 2, Amir and other Muslim activists wanted to ensure that a Muslim candidate ran for the school board. “We said we needed to find someone who is going to represent our voice on the school board,” Amir said. 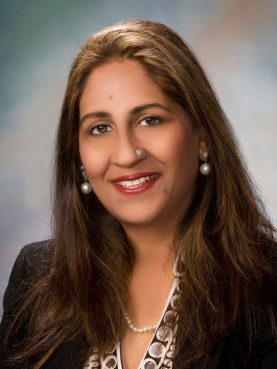 Farida Ahsan, a real estate agent whose two children attended Parkway schools after the family moved from Pakistan in 2007, said she decided to run because she “always wanted to say thank you to the district for helping my kids and making them have a successful career.” (Her son is now a software engineer; her daughter is preparing for law school.) “This is a service I can do for the district,” she said. Ahsan is the first Muslim candidate to run for school board in St. Louis County, according to MBA, and likely in Missouri. But she is not alone as a Muslim on the hustings. The Associated Press reported that there were as many as 90 Muslims running for national or statewide offices during the last election cycle. 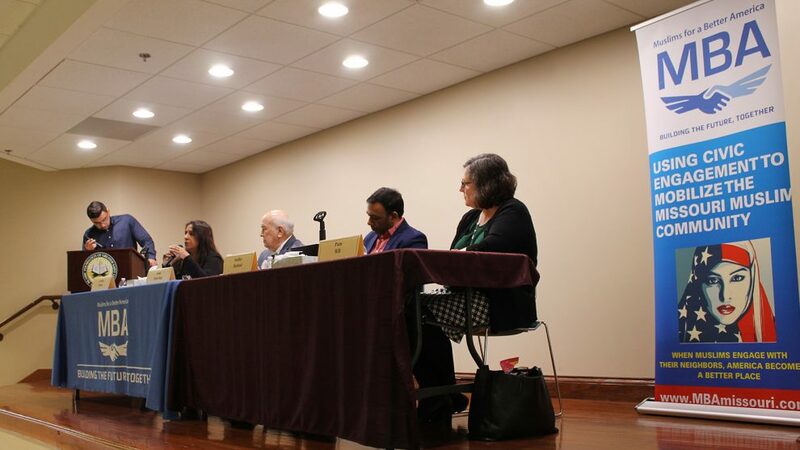 At the MBA forum, which was co-sponsored by the West County Community Action Network and the Council for American Islamic Relations-Missouri, Ahsan did not appear to receive any preferential treatment from Amir, who was the moderator and asked the four candidates questions. There were about 50 people in the audience. Many of the questions dealt with students’ well-being and ensuring that Parkway promotes a tolerant atmosphere. Pam Hill, an art museum educator who is running for the board, said during the prayer break that she appreciated that the forum was held at a mosque. “The churches, the mosques, the synagogues, they are part of the school community, and even though public schools are secular, everybody who comes to services here is one of the constituents of this community, and I think it’s great that they are involved,” she said. The other candidate is Sam Sciortino, a current board member who spent 36 years as a teacher and administrator in the district. Maliha Aziz, a former Sunday school teacher at the Islamic Foundation and a former Parkway parent, attended the forum and said it helped her determine who she would vote for, though she declined to share her picks. She agrees with Amir that more Muslims need to become involved civically.